NIST physicist John Kitching displays the heart of the world's smallest atomic clock. This "physics package" is about the size of a grain of rice. The heart of a minuscule atomic clock—believed to be 100 times smaller than any other atomic clock—has been demonstrated by scientists at the Commerce Department's National Institute of Standards and Technology (NIST), opening the door to atomically precise timekeeping in portable, battery-powered devices for secure wireless communications, more precise navigation and other applications. Described in the Aug. 30, 2004, issue of Applied Physics Letters, the clock's inner workings are about the size of a grain of rice (1.5 millimeters on a side and 4 millimeters high), consume less than 75 thousandths of a watt (enabling the clock to be operated on batteries) and are stable to one part in 10 billion, equivalent to gaining or losing just one second every 300 years. In addition, this "physics package" could be fabricated and assembled on semiconductor wafers using existing techniques for making microelectromechanical systems (MEMS), offering the potential for low-cost mass production of an atomic clock about the size of a computer chip and permitting easy integration with other electronics. Eventually, the physics package will be integrated with an external oscillator and control circuitry into a finished clock about 1 cubic centimeter in size. "The real power of our technique is that we're able to run the clock on so little electrical power that it could be battery operated and that it's small enough to be easily incorporated into a cell phone or some other kind of handheld device," says physicist John Kitching, principal investigator for the project. "And nothing else like it even comes close as far as being mass producible." The mini-clock is comparable in size and long-term stability to temperature-compensated quartz crystal oscillators, currently used in portable devices. NIST scientists expect to improve the clock's long-term stability and reduce its power consumption to the point where the device could substantially improve the performance of many commercial and military systems that require precision time keeping. The chip-scale clock is the latest advance in time keeping at NIST, which for decades has been a world leader in the development of new technologies for measuring time and frequency. Atomic clocks long have provided the most accurate realizations of both of these quantities but also have traditionally been large—up to two meters in height—as well as power-hungry and expensive to build. The new clock is based on the same general idea as other atomic clocks such as the NIST-F1 fountain clock—measuring time by the natural vibrations of cesium atoms, at 9.2 billion "ticks" per second—but uses a different design. In the chip-scale clock, cesium vapor is confined in a sealed cell and probed with light from an equally small infrared laser, which generates two electromagnetic fields. The difference in frequency of these two fields is tuned until it equals the difference between two energy levels of the atoms. The atoms then enter a "dark state" in which they stop absorbing and emitting light; this point defines the natural resonance frequency of cesium. An external oscillator, such as quartz crystal like those found in wristwatches, then can be stabilized against this standard. The chip-scale clock is less accurate than larger atomic clocks such as fountain clocks. However, the clock's small size, low power dissipation and potentially low cost make it ideal for a variety of commercial and military applications. 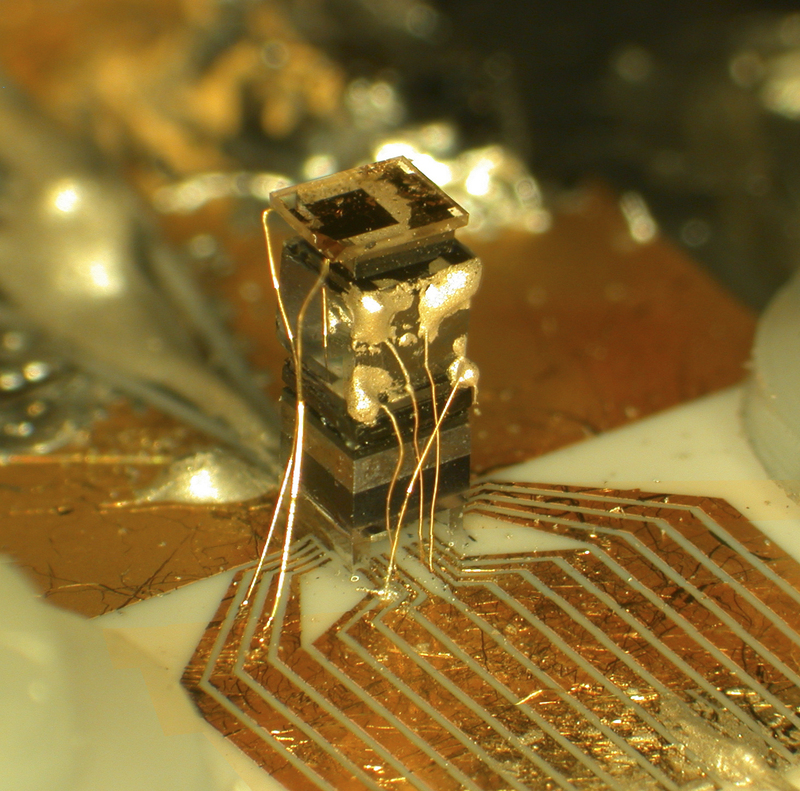 Compared to quartz crystal oscillators, the most precise time and frequency references of equivalent size and power, chip-scale atomic clocks potentially offer a 1,000-fold improvement in long-term timing precision. Chip-scale atomic clocks have many potential uses. In wireless communications devices, these clocks could improve network synchronization and channel selection to enhance security and anti-jamming capabilities. In Global Positioning System (GPS) receivers, small clocks could improve the precision of satellite-based navigation systems such as those used in commercial and military vehicles and emergency response networks. In addition, as atomic clocks get smaller and cheaper and use less power, they could replace quartz crystal oscillators in many common products such as computers, offering several orders of magnitude better time keeping. The integrated design described in the paper also could be modified to make millimeter-scale magnetic field sensors based on atoms as well as a variety of other miniaturized spectroscopic tools and devices. The work was supported by NIST and the Defense Advanced Research Projects Agency (DARPA). For more information on the chip-scale clock, go to http://www.boulder.nist.gov/timefreq/ofm/smallclock/.